Hop on US Hwy 18 on the west side of Milwaukee for a more scenic ride. Click the photo to order your 18" x 24" Easy Rider print from Amazon. Bridge of the Gods, Cascade Locks, Oregon. Wikipedia photo by User:Cacophony. Click on the photo to enlarge it. Ape Cave is 1.5 hours northeast of Portland, Orgeon. Click the Google map to enlarge it. Ape Cave is south of Mt. St. Helens Washington. Mt. Hood Scenic Loop. Click the map to view the pdf file. "We drove the Mt Hood Scenic Loop today and it is well worth doing if you are in Portland. The roads are excellent and the entire trip is picturesque. Make sure you take the spur to Timberline Lodge; the views of Mt Hood from the lodge are the best you will get. The road is good, but a bit challenging; it rises 2,700 feet over 6 miles!" Google map of the scenic drive around Mt Hood, near Portland, Oregon. "Cascade Locks is one of the oldest towns on the Columbia River. It sits on a section of the river that Lewis and Clark described in their journals as the “great rapids of the Cascades,” a stretch of raging water more than two miles long that was formed by a massive ancient landslide. Because of the dangerous rapids, pioneers moving west had to stop here. A small settlement grew up on the banks of the river in the early 1850s to help travelers portage around the rapids, first by foot, then by mule-drawn rail cars, steam engines, and finally riverboats. Cascade Locks was home to the first steam engine west of the Mississippi, the Oregon Pony, built in 1862 to carry passengers and freight past the rapids (now on display in the Marine Park next to the Cascade Locks Historical Museum)." Bailey Gatzert in Cascade Locks, circa 1915, with Columbia River in background. Wikipedia photo of unknown postcard. Click the photo to enlarge it. Download Oregon State Park Brochures and Maps here. The turn-of-the-century class C-80 Shay, #5 has been toiling up Cheat Mountain for nearly 100 years. "At an elevation of 4,842 feet, Bald Knob is the third highest point in West Virginia. Located 11 miles up the mountain from Cass, the Bald Knob overlook offers spectacular views (on a clear day) into two states and into the valley below, home to the National Radio Astronomy Observatory. The train will also makes a stop at Whittaker Station for a 30 minute layover. A “King of the Road” hobo lunch will be provided to enjoy with your ride as well." Closed most Mondays. 160 miles near the VA / WV state line is a convenient ride, just off I-64. Click the map to enlarge it. Bolar Mountain Campground, on Lake Moomaw, has a nearby parking area and beach. Click the Google map to enlarge it. "With stalactites and stalagmites of every shape and size, witness nature at work on a self-guided tour of the main, 1,000-foot “room.” The Snowy Chandelier, a 30-ton compound stalactite documented as one of the nation’s largest. A column of sparkling, white calcite, aptly named Bridal Veil. And the War Club, a 28-foot stalagmite made famous in 1971 as part of a Guinness World Record achievement... A half-mile long, the tour takes approximately 45 minutes at a casual pace. Be sure to pick up a guide sheet to learn more about the history of the cave and its unique geological formations... It’s a good idea to wear comfortable, flat shoes and a warm jacket. No matter what the temperature is outside, the cave remains a constant 52 degrees." See times and prices here. The Humback Bridge near Covington, VA. Click the TripAdvisor taveller photo for more info. "This is a great place to go for locals and travelers. The historical bridge was recently restored and it takes you back in time as you walk across it. It is the oldest covered bridge in Virginia and one of few remaining in the U.S... Family member suggested we stop at the Humpback bridge on our way back from KY. It was just a few minutes off VA exit 10 on I-64. Beautiful spot and a great area to stretch your legs on a long trip or have a nice picnic... Great spot! This place has picnic tables and bathrooms. It's a beautiful bridge, I finally drove up to see it. If you are ever in the Highlands of Virginia (Covington & Clifton Forge, VA or Lewisburg, WV) be sure to stop here. Great place for pictures!" Rider Magazine published this nice South Dakota ride map on pg 71 in their Favorite Rides and Destinations #05. Click on the map to read the stories. See South Dakota Escape by Mike Koplen. Download the South Dakota ride map from Rider Magazine's Favorite Rides and Destinations #05. Here's a sample of the awe-inspiring photos and article by Mike Koplen. Operating Hours & Seasons - The park's main visitor center, the Ben Reifel Visitor Center, is open daily all year, except Thanksgiving, Christmas, and New Year's Day. During the summer months, ranger-led programs, and other events are offered throughout the day. In the South Unit, the White River Visitor Center is open during the summer months and offers information, restrooms, and cultural exhibits. Lodging - Cedar Pass Lodge is the only lodging and restaurant in the park and offers visitors a memorable stay... Cabins book up fast and visitors should contact the Lodge directly for reservations. Cave tour at Wind Cave National Park in South Dakota's badlands. Click the National Park Service photo to see more photos. All cave tours are ranger-guided and leave from the visitor center. The visitor center is open and cave tours are offered daily except for Thanksgiving, Christmas, and New Year's Days. All tours begin and end at the visitor center... The temperature inside the cave remains 54 degrees F (11 degrees C) year round... The park receives about 18" of rain annually, most falling in the spring. Summers are generally hot and dry, though thunderstorms, some producing large hail, are fairly common. Fall provides warm, dry days and cool evenings... The park is open all day, every day for you to explore... For current road and trail conditions call the visitor center at 605.745.4600. Sturgis Motorcycle Rally draws over 500,000 people to the Black Hills every August. Wikipediia photo. Rider Magazine emailed me link to a nice article about riding near Sturgis. More Sturgis Info on our Western US rides page. Click here. One of the great views from the Cherohala Skyway in western NC. The Cherohala Skyway is not unlike the Blue Ridge Parkway, with limited access, but almost no traffic on a Thursday in July. It's mostly 40 mph sweepers once you navigate the tighter curves near Robbinsville, NC. The skyway travels through pristine wilderness as it crosses the border between Tennessee and North Carolina, just 25 miles south of the much more famous "Tail of the Dragon". You can ride both in one day. Tailofthedragon.com has great ride maps and lodging info. The 43 mile Cherohala Skyway connects Robbinsville, NC and Tellico Plains, TN. The Cherohala Skyway connects Robbinsville, NC and Tellico Plains, TN. Click the map to enlarge it. Click above to see the whole USDA camping and day use guide pdf. Reno Nevada and the "loneliest road"
Motorcycles at Lookout Point on Geiger Grade Rd south of Reno, Nevada. Google Maps photo. Reno, Nevada and Lake Tahoe are not thought of as motorcycle ride destinations, but get away from the crowds and discover what's nearby. Just north of Carson City, Washoe Lake State Park has many campsites and activities. There's a great view from Lookout Point on Hwy 341. Continue south to Virginia City for a helping of gold rush history at The Way It Was Museum. South of Reno, Nevada there's a great view and tons of local history. Camp in Washoe Lake State Park and then head east on US Hwy 50, nicknamed the "loneliest road" in the U.S. Click the map for more. If you feel like some alone time, US Highway 50 will take you all the way to Utah and beyond. From Washoe Lake State Park, Fallon is 68 miles and Eureka is another 180. Both have food, fuel, and lodging. The Utah border is still 141 miles east of Eureka. You may want to fuel up in Ely on the way. Snow-capped Prospect Peak (elev 9573 ft) seen from US 50 near Eureka, Nevada. Google Maps photo. Steam engine at Nevada State Railroad Museum in Carson City, Nevada. TripAdvisor photo. Trilby Road, east of Brooksville, FL. Many roads near here have hills and curves. If you think all of Florida is flat, you've missed west central Florida near Brooksville, just 45 miles north of downtown Tampa. I've spent lots of seat time in this area, so I'll give you some of my personal favorites. Ride this route starting at Burwell Road/ Hwy 575, so you end in Brooksville. Don't miss the view at the top of the hill as you pass Boyette's Grove and Citrus Attraction. It's just after you turn left off Old Spring Lake Road. The Brooksville, Florida area has surprisingly good roads for motorcycles. Click to enlarge the map. The Lake Lindsey Mall & Deli, on the corner of Hwy 581 and Hwy 476. The cuban sandwich is good. Take it slow to enjoy Hwy 39 thru Istachatta. There's a tree canopy leading into Floral City on Hwy 48. Sandia Crest Scenic Byway, near Albuquerque, NM, is the highest scenic byway in the southwest. The Tinkertown Museum on Sandia Crest Road has unique woodcarving displays. It's earned a TripAdvisor Certificate of Excellence. Click the photo for more information. 900 mile motorcycle ride from Albuquerque, NM includes Carlsbad Caverns National Park. First come, first serve. All Gila NF campgrounds have a 14 day stay limit. There is no fee for this campground ($0.00). Area Amenities: Tent camping, Camping trailer, Picnic tables, Toilets, Parking, NO Potable Water, It is recommended that visitors bring their own firewood. There is a 14-day stay limit. OHV/ATVs are prohibited in the campground. Hunting and shooting are prohibited in the campground. Stock is not allowed in the immediate campground. The watersheds above the campground were severely burned during the Silver Fire in 2013. Please be aware that flooding could occur during rain storms. NM Hwy 152 takes you across Emory Pass at 8228 ft, on the way to Iron Creek Campground. There is no lodging inside the park. However, if you are planning on staying in the park, Guadalupe Mountains operates two frontcountry campgrounds. NOTE: all camping is at a first come, first served basis. There are no reservations for individual sites. Pine Springs Campground - 20 tent sites, 20 RV sites (accommodates up to 50 feet), and 1 stock corral site. Campgrounds are accessible. Dog Canyon Campground - 9 tent sites, 4 RV sites, 1 stock corral site. Campground is accessible. National Park Service photo of Cliff Palace in Mesa Verde National Park, Colorado. "Mesa Verde National Park opened its new Visitor and Research Center in mid-December, 2012. This new LEED® (Leadership in Energy and Environmental Design) building, located at the park entrance, replaced the aging Far View Visitor Center as the park's primary facility for orienting visitors to opportunities within the park and surrounding area. It also houses a state-of-the-art research and storage facility for the park's archives and museum collection of over three million objects. Mesa Verde National Park is near the southwest corner of Colorado. See more info about the area and this ride map. Southwest Colorado offers plenty of great riding, including US 550, aka the "Million Dollar Highway". The map also includes Colorado 149 north thru Creede. Spend the night in Montrose, giving you time to explore the Black Canyon of the Gunnison National Park, before continuing on to Ouray and Silverton on US 550. Google map of southwest Colorado. Click the map to enlarge it. "The Million Dollar Highway stretches for about 25 miles (40 km) in western Colorado and follows the route of U.S. 550 between Silverton and Ouray, Colorado. It is part of the San Juan Skyway Scenic Byway. Between Durango and Silverton the Skyway loosely parallels the Durango and Silverton Narrow Gauge Railroad. Chimney Rock National Monument between Durango and Pagosa Springs off US Hwy 160. The Durango & Silverton Narrow Gauge Railroad Museum in Durango has planes & autos, too. "On Saturday, August 20, 2011, a representative from the Guinness World Record traveled to Pagosa Springs, Colorado to oversee the measurement of the deepest geothermal hot spring, located at The Springs Resort and Spa. It was measured by a plumb line that was capable of reaching a maximum depth of 1002 ft. This was a new record category, so a minimum requirement had not yet been set. The plumb line was lowered into the main hot spring, also known as the "mother spring", as everyone watched and waited in great anticipation. After about ten minutes, the line ran out without hitting any obstacles, and a new Guiness World Record was set at 1002 ft. What makest his record interesting is that no one really knows just how deep the hot spring is. Every time the spring has been measured, the plumb line has run out before reaching the bottom. A Google Maps view from Badger Mountain Rd near Wenatchee, Washington. Ride about 150 miles east of Seattle, WA to enjoy this view on Badger Mountain Road, east of where US Highway 2 follows the Columbia River. Another couple of hours gets you to the Grand Coulee Dam. Click on the Google Map below. Badger Mountain Road is between Seattle and Grand Coulee Dam in Washington State. Click the Google Map to enlarge it. "Grand Coulee Dam forms Lake Roosevelt, extending 151 miles upstream to the Canadian border. It has a 600-mile shoreline and a surface area of 82,000 acres. In 1948, Congress designated Lake Roosevelt National Recreation Area, which is operated by the National Park Service. Grand Coulee Dam provides water to irrigate approximately 600,000 acres in the Columbia Basin Project. In addition to its irrigation and power functions, Grand Coulee Dam is a primary factor in controlling the floods on the Columbia River." "Grand Coulee's laser light show, One River, Many Voices, is held nightly at Grand Coulee Dam starting the Saturday of Memorial Day Weekend through September 30. The show lasts about 30 minutes and is free of charge." Grand Coulee Dam in central Washington has a laser light show in August and September. St. Louis is famous for lots of things like the Gateway Arch, Anheuser-Busch, and St. Louis Cardinals baseball. There's also lots of historic motorcycles stored in museums around the city. There's over 350 motorcycles at Mungenast Classic Museum in St. Louis, MO. 1912 Indian Board Track Racer at Mungenast Classic Museum in St. Louis, MO. "The first Indian motorcycle was created by the Hendee Manufacturing Company in 1901. George Hendee and Oscar Hedstrom became co-founders of what was soon to be an award-winning brand. ... However, Indian’s success ran out in 1953, when the company went bankrupt ... By 1998, brand-exclusive production of Indian Motorcycle models resumed. Then, in 2003, Indian Motorcycle Company of America went bankrupt again and ended production. The tumultuous history of the Indian Motorcycle Brand ends on a good note, because in 2011 Polaris Industries acquired Indian Motorcycle, and Indian has been in production ever since." St Louis, Missouri is a good stop for historic motorcycles. Click the map to enlarge it. Call ahead if you want to visit the free Moto Museum. Click the photo for info. Since you're nearby, you might want to stop by Fast Lane Classic Cars in St. Charles to see their current inventory of cars and bikes. Fast Lane Classic Cars, St. Charles, MO. Yelp photo by Robin O.
Nebo Loop Road runs for 32 miles south of Payson, UT. It sits between I-15 and US 89. Click the map to enlarge it. The Devil's Kitchen is an easy 0.2 mile walk to a scenic view of a formation that reminds you of Bryce Canyon, but way smaller. While the Devil's Kitchen is a nice stop along the Nebo Loop Road, you are only 180 miles north of Bryce Canyon National Park. We stayed at Ruby's Inn located on Hwy 63 just north of the park entrance, or there's camping available at Otter Creek State Park along the way. "There is no place like Bryce Canyon. Hoodoos (odd-shaped pillars of rock left standing from the forces of erosion) can be found on every continent, but here is the largest collection of hoodoos in the world! Descriptions fail. Photographs do not do it justice. Bring your sense of wonder and imagination when visiting Bryce Canyon National Park." Zion National Park is very different from Bryce Canyon. You look down into Bryce Canyon, but look up at the spectacular peaks towering above Zion National Park. Located in Lindon, Utah "Timpanogos Harley-Davidson® proudly offers what we call Timp Tours, which is a ride-planning service where you can book a guided tour for your group essentially anywhere you’d like to go." There are vintage motorcycles on display throughout the 2-story building. Timpanogos Harley-Davidson is housed in a reclaimed steel mill from WWII. "The Royal Gorge Bridge is a tourist attraction near Cañon City, Colorado within Royal Gorge Bridge & Park, a 360-acre amusement park located along the edge of the Royal Gorge around both ends of the bridge. The bridge crosses the gorge 955 feet above the Arkansas River and held the record of highest bridge in the world from 1929 until 2001 when it was surpassed by the Liuguanghe Bridge in China. The Royal Gorge Bridge maintained the title of the world's highest suspension bridge until the Beipan River Guanxing Highway Bridge was completed in 2003, also in China. The bridge remains the highest bridge in the United States and was among the ten highest bridges in the world until 2012." The Gorge is located 58 miles SW of Colorado Springs, CO.
"There are multiple ways to experience the grandeur of the gargantuan Royal Gorge Bridge. Stroll across to stand 956 feet above the Arkansas, marvel at the structure’s complex engineering and peer over the edge to spot whitewater rafters cruising the rapids down below. Or glide across to soak up jaw-dropping 360-degree panoramas of the rugged canyon and neighboring mountains from the comfort of a slick aerial gondola. ... The Cloudscraper ZipRider is North America’s highest zipline and allows intrepid visitors to soar 1,200 feet above the Arkansas using the latest harness and breaking systems. Open March 11, 2017–January 7, 2018, the zipline is a hand-free, bucket-list-worthy ride. The Royal Rush Skycoaster, which drops visitors in a 50-mile-per-hour free fall and dangles them above the river, is another stomach-flipping experience. Up to three people can embark on the ride together — so you don’t have to brave the coaster alone! ... With slides, nets, tunnels, 20-foot towers and a splash pad, the park’s new Tommy Knocker Playland keeps little ones occupied for hours. Other grin-inducing activities for kiddos include gold panning and a classic carousel. Meanwhile, the new Visitor Center is the place to watch zipliners fly across the gorge from the sunny deck, grab a bite to eat amid incredible views at Café 1230 and pick out souvenirs at the gift shop. And shutterbugs will delight in the numerous Photo Lookout Areas located throughout the park — making it super easy to capture Insta-worthy photos of the bridge, gorge and surrounding area." Click above to buy this book at Amazon.com now. "This road is not for novice riders. It is not for sissies. There are very few guard rails. Death and danger lurk around every curve." Shunkawauken Falls on White Oak Mountain Road, near Columbus, NC off I-26 not far from the NC / SC border. Shunkawauken Falls, 4 miles off I-26. North of Wilder TN you come upon these wooded switchbacks. Click the photo for the Google map. The Cumberland Mtn General Store / Diner is on US 127 in north central Tennessee. The Cumberland Mtn General Store and Rock-A-Billy Diner is between Knoxville and Nashville, north of I-40 on US 127. They host Friday night Cruise-ins during May thru October. The 50's style diner serves old fashioned burgers, hotdogs, fish, fries, onion rings, milkshakes, hand-dipped ice cream and more! There's syrup flavors for your fountain drinks. Check their limited hours, especially on weekdays. See the menu here. The Rock-A-Billy Diner at the Cumberland Mtn General Store in north central Tennessee. Off US 127 in north central Tennessee this 143 mile ride waits just north of I-40. Go North of the switchbacks, also on our 140 mile route. Charles Childers says on Facebook — "If you are ever in Alpine TN at the junction of TN85 and TN52 make sure you stop in and talk with the owner Kathy Smith; you won't meet a nicer business owner/lady/person. Kathy exemplifies country charm and kindness which seems to have been lost in society today, especially the big cities. While you're there, buy something, have a snack and/or a sandwich which Kathy will be glad to make for you. The West Fork General Store is a rare gem I didn't think existed anymore. The West Fork General Store is also located on a superb motorcycle ride, "Aces and Eights" (best done in a clockwise direction) just north of Crossville TN. Kathy has plenty of maps provided by wildrides that illustrate the "Aces and Eights" ride as well as many others in NC, SC and TN. ; the maps are available free along many popular motorcycle routes in these three states." Standing Stone State Park has campsites, cabins, and group lodges. "The park has 36 campsites, each with grill, picnic table, water and electricity. There are also 17 historic WPA cabins and seven more modern cabins available that can be reserved up to a year in advance. All cabins are completely equipped for housekeeping including appliances, microwave oven, cooking utensils and linens. The park has three group lodges ranging in size and accommodations. You have a great chance to see the total solar eclipse this month as it crosses the US from Oregon at 10:15am PDT to South Carolina, exiting at 2:50pm EDT. The eclipse will be viewable from most locations, but it won't be a total eclipse unless you are close to the path - so check the NASA maps here. Maine will only see a 50% to 60% eclipse, 75% in San Francisco, 85% in Orlando and Chicago, 60% in Los Angeles, and San Antonio, TX. 80% eclipses for Cleveland, Pittsburgh, and DC. Check the NASA maps here. You'll see at least a partial solar eclipse from anywhere across America in the lower 48 states. about 2:30 pm over western NC. Viewable from Tail of the Dragon US129 & Cherohala Skyway on the TN / NC border. Unicoi Crest overlook would be a great place to view the eclipse. The 2017 eclipse path crosses the US from Columbia, SC to Salem, OR. Click here for more NASA eclipse info. Stugis Motorcycle Rally is held each August. Click the photo for our Sturgis page. 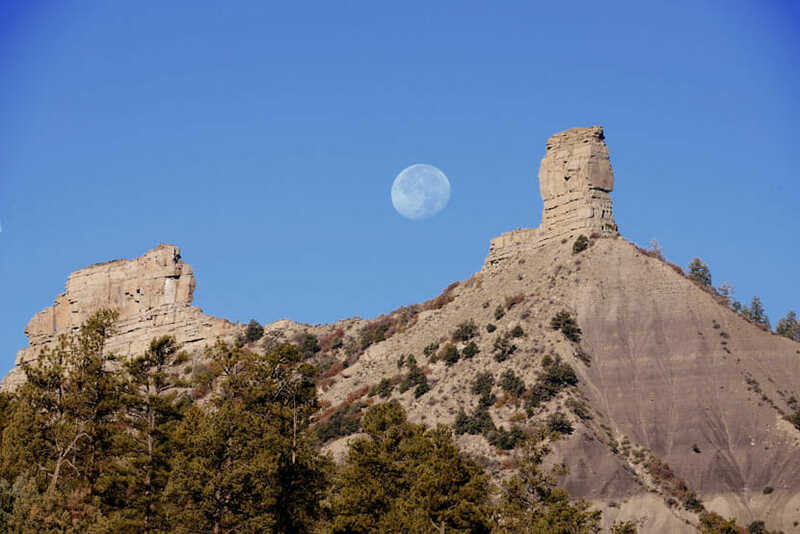 There's more to see when you go to Sturgis. Click the map to enlarge it. Mitchell, South Dakota, 75 miles east of Sioux Falls on I-90, is home to the Mitchell Corn Palace, an impressive structure covered with corn and other grains. I had lunch with Bill & Cheryl, riders from southern Wisconsin, who visited on a trip to Mt. Rushmore. There's even a Corn Palace Festival. One of the many incredible rock formations that tower above you in Zion National Park, Utah. National Park Service to increase price of Senior Passes. "On August 28, 2017, the price of the America the Beautiful – The National Parks and Federal Recreational Lands Senior Pass will increase for the first time since 1994. The additional revenue will be used to enhance the visitor experience in parks. The lifetime Senior Pass will increase from $10 to $80. ... The current passes are lifetime passes and will remain valid. ... US citizens or permanent residents 62 years or older are eligible for the Senior Pass. Annual and lifetime Senior Passes provide access to more than 2,000 recreation sites managed by six federal agencies: National Park Service, US Fish & Wildlife Service, Bureau of Land Management, Bureau of Reclamation, US Forest Service, US Army Corps of Engineers. The passes cover entrance and standard amenity (day-use) recreation fees and provide discounts on some expanded amenity recreation fees. ... traveling companions can also enter for free. The Senior Passes admit pass owner/s and passengers in a noncommercial vehicle at per-vehicle fee areas and pass owner plus three adults, not to exceed four adults, where per-person fees are charged. (Children under 16 are always admitted free.) Also, at many sites, the Senior Passes provide the pass owner (only) a discount on Expanded Amenity Fees (such as camping, swimming, boat launching, and guided tours). "We are experiencing a major increase in Senior pass sales. If you need your pass in less than two months, consider purchasing your pass at the first site you visit. Online Senior passes are currently being processed within nine weeks. Mail in Senior and Access pass applications are currently being processed within twelve weeks. All eligible Senior pass orders postmarked before August 27 will be processed at the $10 price. Lifetime Senior pass orders postmarked after August 27 will be processed at the $80 price. Additional processing fees of $10 apply." "The Curtiss V-8 motorcycle was a 269 cu in (4,410 cc) V8 engine-powered motorcycle designed and built by aviation and motorcycling pioneer Glenn Curtiss that set an unofficial land speed record of 136.36 miles per hour (219.45 km/h) on January 24, 1907 ... Curtiss remained "the fastest man in the world," the title the newspapers gave him for going faster than any vehicle, on land, sea or air, until 1911, when his absolute record was broken by the 141.7 mph (228.0 km/h) Blitzen Benz automobile. No motorcycle surpassed the record until 1930. Curtiss's success at racing strengthened his reputation as a leading maker of high-performance motorcycles and engines." The Letchworth State Park is advertised as "The Grand Canyon of the East", and it certainly is quite impressive and beautiful, even though it cannot stand comparison with the Grand Canyon. This video shows views from the Gorge Trail and from West and East rims, with the Lower, Middle and Upper falls. 80 mile loop northeast of Asheville, NC. Click the map to enlarge it. View of Mt Mitchell from the Blue Ridge Parkway overlook. Newspaper Rock is located along Scenic Hwy 211 in southeast Utah. Click the photo to see more. SE Utah has great rock formations. Click on the Google map. Southeast Utah has lots more to offer besides Monument Valley on the Arizona border and Arches National Park near Moab, UT. Ride 25 miles south of Moab on US 191 and you'll find Wilson Arch, a natural sandstone arch with a span of 91 feet and height of 46 feet, visible from the road to the east. There are turnouts for parking. Further south, Utah hwy 211 takes you to the Newspaper Rock petroglyph shown above. Wilson Arch is 46 ft high and visible from US 191 just 25 miles south of Moab, Utah (Arches NP). Wilson Arch on US 191 in southeast Utah is 91 ft wide. The 60 mile round-trip to Big Spring Canyon Overlook provides more to see on SE Utah Hwy 211. "The Needles district is named for the Cedar Mesa sandstone spires that jut up from the landscape. Located in the southwest section of Canyonlands National Park ... The Needles district can be accessed from towns along Highway 191 by heading west on Highway 211 to the Visitor Center, which is open year-round. From there, a scenic road winds through a section of the Needles to Big Spring Canyon Overlook for an expansive view. Stops along the way include Roadside Ruin, Cave Spring, Pothole Point, and Slickrock Trail. Short interpretive trails at these stops are a great way to experience the park for visitors with only an hour or two to explore." "There are three small campgrounds in the Needles district to accommodate overnight visitors: Squaw Flat, Wooden Shoe, and Split Top. Squaw Flat Campground is the largest, with 26 sites, bathrooms, grills, picnic tables, tent and RV pads. Campgrounds fill fast from March to October, and reservations are required for large groups." One of many rock formations along US Hwy 191 in the southeast corner of Utah. Google Maps view. Highways 31, 66, and 70, just west of Kingsport, TN could be called the Tennessee Twisted Sisters. Two hours north of Gatlinburg, TN nestled between I-81 and I-75, these three parallel roads are waiting to be ridden. (See larger map) There's easy access from I-81 west of Kingsport, TN and east of Knoxville. US Hwy 421 is also nearby. Ride US 421, "The Snake"
The National Motorcycle Museum in Alamosa, Iowa has over 450 motorcycles for you to enjoy. 65 miles west of the Mississippi River, Alamosa is also the home to J&P Cycles. Click the photo for the Google map. Donate to be eligible to win National Motorcycle Museum's 2017 Indian Chief Vintage, MSRP $20,999. "The non-profit National Motorcycle Museum is one of America’s motorcycling treasures. Large in scale with over 450 motorcycles from over a dozen countries, with diverse collections and interpretive exhibits, it tells the great stories of American motorcycling. So we are always grateful for your support; you have helped make it happen. We hope the new larger facility with more motorcycles, more memorabilia are something you feel part of, something you can say you helped to create through your support." "The drawing for the two winners*, motorcycle and jacket, winner will be held on Friday, December 29, 2017 at 2:00pm. ... "
"The National Motorcycle Museum is a 501(c)(3) non-profit corporation that relies on donations and fund-raising activities including this raffle to help preserve and present the exciting history of motorcycling." Win this Indian Motorcycle 2017 Chief Vintage. Donate to the National Motorcycle Museum to be eligible to win. Click the photo for more info. Fifteen miles from Maggie Valley and Asheville, our route begins in Canton, NC and includes Crabtree Mountain Road CR 1509, NC 63, and others. Click the Google map to enlarge it. NC 209 aka the Rattler has the twisties. "For many motorcycle enthusiasts, North Carolina Highway 209 is as good, if not better, than either the “Dragon” or the “Snake.” There is almost zero traffic, great scenery, and a little bit of everything: high-speed sweepers, twisties, elevation changes, and a couple of scenic valley straightaways." "Best of all, you have all of the amenities of Hot Springs at the finish line — places like Iron Horse Station — and Trust General Store & Cafe to break up your run. Trust General Store & Cafe is the perfect pit stop, sitting almost smack dab in the middle of I-40 and Hot Springs. We have plenty of parking, fuel, food and refreshments, T-shirts, hats, and more. If you’re planning a motorcycle run on NC-209 with a large group, give us a call in advance and we’ll make sure we’re prepared for your arrival. Just call (828) 622-7455 and let us know you’re on your way!" Trust General Store and Cafe, at the intersection of NC 209 and NC 63, is a popular motorcycle stop. Hungry? The Smoky Mountain Diner received a TripAdvisor Certificate of Excellence. "We had a huge breakfast here our last morning in town. Coffee was good, food was good and a lot of it. The pancakes were just like grandma's! We got a sandwich to go for the trail and they were huge. Perfect Diner!" This stretch of US Hwy 276 crosses the Blue Ridge Parkway, is just 30 miles from Wheels Through Time Museum in Maggie Valley, and 100 miles from the Tail of the Dragon on US Hwy 129 near the Tennessee Border. Looking Glass Falls is 10 miles south on 276. It's easy accessibility makes Looking Glass Falls a popular spot for travelers along U.S. 276, Forest Heritage Scenic Byway, near Brevard in the Pisgah National Forest. Enjoy nice views from the parking area along the road. Or take a short walk for a closer look. The waterfall is 60 feet tall. 60 ft tall Looking Glass Falls can be seen from the parking area on US Hwy 276 near Brevard, NC. Travel 25 miles north of Boone, NC on US 421 across the NC/TN line to the small town of Mountain City, TN and ride "The Snake" and it's 489 curves in 33 miles. "The Snake" is about 200 miles northeast of the "Tail of the Dragon", the most famous of all rides in the Smoky Mountains, with it's 318 curves in 11 miles. US 321 travels 150 miles across eastern Tennessee from Boone to Gatlinburg. The famous motorcycle and sportscar road, Tail of the Dragon on US 129, is south of Maryville, TN. Click the map to enlarge it. "The Beaver Bridge in Beaver, Arkansas is a historic one-lane suspension bridge carrying Arkansas Highway 187 over the White River at Table Rock Lake. Built in 1949 by the Pioneer Construction Company, the structure is the only suspension bridge open to traffic in Arkansas. The Beaver Bridge was added to the National Register of Historic Places in 1990." The map shows the location of the Beaver Bridge in NW Arkansas, near Eureka Springs. NW Arkansas has great roads for motorcycle riding. One of my favorite roads in NW Arkansas was the 25 miles from Harrison to Ponca on Hwy 43 with the early morning fog in the valley below. See more NW Arkansas riding. Early morning on Arkansas Hwy 43 from Harrison to Ponca. Ride this 109 scenic miles on the State of Jefferson Scenic Byway. We begin in Yreka, CA, 35 miles north of Mt. Shasta, near the Oregon state line. From Main Street we ride north on Hwy 263 then west on California 96, which follows the Klamath River to Happy Camp, where this Bigfoot Statue waits. Greyback Road takes you north to O'Brien, Oregon. Many locals call this area the "State of Jefferson". Northern California - 109 mile State of Jefferson Scenic Byway. Mt. Shasta in the bottom right corner stands 14,179 ft high and can be seen from I-5. Click the map to enlarge it. “In October 1941, the mayor of Port Orford, Oregon, Gilbert Gable, said that the Oregon counties of Curry, Josephine, Jackson, and Klamath should join with the California counties of Del Norte, Siskiyou, and Modoc to form a new state, later named Jefferson. On October 24, 2014, Modoc and Siskiyou Counties delivered their declarations for independence from the state of California to the California Secretary of State's office. On January 15, 2015, three more counties, Glenn, Tehama, and Yuba, submitted their official declarations as well.” Click the link below for more info. This easy to follow 90 mile loop, just off I-94, offers a scenic ride thru western Minnesota. This route has fewer highway changes than the nearby 150 mile Otter Trail Scenic Byway, which shares some of the same roads. There's lodging and restaurants in Ottertail. Get some BBQ at Elmer's Authentic Texas Bar-B-Que or stop at Zorbas on Ottertail Lake for some handmade pizza. Glendalough State Park has campsites and cabins. Kayak rentals are available as well as canoes and rowboats. They are available first-come, first-serve unless you have a canoe-in site reservation. Staying overnight? There are 22 cart-in sites; 3 canoe-in sites; 1 group camp and 1 camper cabin. The camping and lodging facilities close for the season on Sept. 3, but the park remains open for day users. A Minnesota state park permit is required for each vehicle. You can buy them upon entry. There are no restaurant facilities at the park. Bring your own food and stove, or forget the stove and cook over a campfire. Begin at I-84 near Bliss, Idaho and follows US 30 southeast through Twin Falls to Idaho 50, then north on Idaho 50 to I-84. Also US 93 from Twin Falls north to I-84. “The Thousand Springs Scenic Byway winds through 67 miles of the most remarkable geology and natural beauty in Idaho. Here, you’ll find thousands (really!) of incredible waterfalls, soothing hot springs, charming small towns, and Idaho’s famous trout. Order your free southern Idaho visitors guide. “In 1974, Mr. Knievel decided he would jump 1,600 feet across the Snake River Canyon in Idaho. Before thousands of spectators and thousands more on a closed-circuit television broadcast, he took a rocket-powered motorcycle up a 108-foot ramp at 350 miles an hour and soared some 2,000 feet over the canyon floor. See the Smithsonian Channel video about the jump. Independence Pass on Colorado 82 east of Aspen is closed in winter. East of Aspen on CO Hwy 82, Independence Pass crosses the Continental Divide. It's closed in winter. Get current road info at the Colorado DOT website. "Independence Pass, originally known as Hunter Pass, is a high mountain pass in the Rocky Mountains of central Colorado in the United States. It is at elevation 12,095 ft (3,687 m) on the Continental Divide in the Sawatch Range. The pass is midway between Aspen and Twin Lakes, on the border between Pitkin and Lake counties. State Highway 82 traverses it, in the process reaching the highest elevation of a paved Colorado state highway on a through road. After Cottonwood Pass to the south, it is the second-highest pass with an improved road in the state, the fourth-highest paved road in the state and the highest paved crossing of the Continental Divide in the U.S. Because of the heavy snowfall at its elevation, it is closed in wintertime, isolating Aspen from direct access from the east during the ski season. When the pass is open in warmer weather, it is a popular destination. A scenic overlook near the pass allows visitors to take in the alpine tundra environment above treeline, and offers excellent views to the east of Mount Elbert, Colorado's highest peak and the second-highest mountain in the contiguous United States. Rock climbers are drawn to nearby bouldering opportunities, and informal paths lead to nearby mountain summits of even higher elevation. Backcountry skiers make use of the slopes during the late spring and early summer. Since 2011 the pass has been on the route of the USA Pro Cycling Challenge." This section of the Historic Lincoln Highway is not far from the Pennsylvania / Maryland border and includes Gettysburg, Bedford, Lancaster, and the Flight 93 Memorial near Stoystown. Dutch Wonderland is an amusement park with 3 roller coasters. The Historic Lincoln Highway is close to Baltimore, Pittsburgh, and Philadephia. Along this 200 mile stretch of the Historic Lincoln Highway is the town of Bedford, PA where the covered bridge loop is a Trip Advisor favorite. Catch a movie at the Pitt Theater, in operation since 1939. Pinball fans may enjoy a stop at Pinhead Amusements. Highway 116 offers some twisty riding near Knoxville, TN on this Google map. Click the map to see the entire 100 mile route. Ride about 25 miles north from Knoxville, TN to the city of Rocky Top, where highway 116 takes you down the valley southwest thru Fratersville and Briceville. A few miles later the road suddenly doubles back northward over the mountains and becomes a great deal more exciting. Ten miles later, the highway crosses the New River and heads southwest again toward Fork Mountain. Then there's 5 miles of twisties, as shown in the photo above. Finally, our 100 mile route follows highway 62 back to Knoxville. Click on the Google map to see the entire route. Big Ridge State Park is about 25 miles north of Knoxville, Tennessee. "Big Ridge State Park was first developed by the Tennessee Valley Authority (TVA), the National Park Service and the Civilian Conservation Corps (CCC) in the 1930s as part of the greater Norris Project. The park was one of three of the project's demonstration recreational areas that eventually became state parks (Norris Dam State Park and Cove Lake State Park are the other two)." This maple tree on US 58 shows off it's fall color. Yesterday we went west on US 58 and found splendid color in the elevations above 4000 feet. The scenery between Mouth of Wilson, VA and Damscus, VA was very colorful - what a nice ride. Nice color at elevations above 4000 feet near Grayson Highlands State Park in SW Virginia. This highway has lots of color this weekend. You can take US 58 across southern Virginia. Louisiana has 3 of the 10 longest bridges in the world. According to the Guinness Book of World Records, the Lake Pontchartrain Causeway is the longest continuous bridge passing over water, the waters of New Orleans's Lake Pontchartrain to be exact. The bridge is so long that for 8 of its 24 miles, you can't see land in any direction. Back in Louisiana, approximately one third of I-55 passing through the state is carried across swamplands on the Manchac Swamp Bridge. Since each of the concrete piles had to be driven more than 250 feet into the swamp, each mile of the bridge cost an average of $7 million to complete. When driving through Louisiana, it sometimes feels like you're never not on a bridge, especially when you're driving down I-10 between Baton Rouge and Lafayette. This stretch of highway passes over the Atchafalaya Basin, the largest swamp in the United States. Our 202 mile route in southern Louisiana crosses 3 of the longest bridges in the world. Click above to see the Google map. Tour the grounds where the famous Tabasco Pepper Sauce is made in Avery Island, Louisiana. Part of the 100 mile detour ride near Palm Springs, California. Click the photo for the Google map. This 100 mile detour begins and ends on I-10 near Palm Springs, and may just be the highlight of your trip across southern California. The route heads south from Banning, CA and loops back north thru Palm Springs. Other areas of interest nearby are Joshua Tree National Park and the Salton Sea. This mountain ride on CA Hwy 243 is a welcome change from I-10 near Palm Springs, CA. Joshua Tree National Park and the Salton Sea are nearby. Click above for the Google map. North Shore Beach & Yacht Club and museum on the Salton Sea in the southern California desert. "Welcome to one of the world’s most unforgettable stretches of coastline. This roughly 90-mile-long stretch of redwood- and fog-trimmed waterfront between Carmel-by-the-Sea and Hearst Castle has no specific boundaries, no urban core, drawing you (and writers like Henry Miller and Beat Generation darling Jack Kerouac) in with a magic allure that is almost palpable. This is, quite simply, a place you want to be—bluffs, sea, and sky. Drive Big Sur’s length via twisting Highway One, with plenty of pullovers at places like seen-it-in-a-million-car-commercials Bixby Bridge..."
"Another favorite photo op: McWay Falls, a silvery cascade that falls some 70 feet from the sea cliffs to a remote beach below. Look up to see endangered California condors, North America’s largest birds, or look down to scan the swells for migrating whales or sea otters floating among dense beds of kelp, California’s signature seaweed. Try the famous Ambrosia burger on the deck of Nepenthe, then nurse your beer to watch the sunset." "Want a short hike with a huge reward? The ½-mile/1-km round-trip Waterfall Overlook Trail at Julia Pfeiffer Burns State Park could be the biggest-bang-for-not-much-work hike on the planet. The almost flat stroll ends an oceanfront overlook with flawless views of McWay Falls, a favorite spot of Big Sur pioneer woman Julia Pfeiffer Burns, for whom the park is named. Let’s just say Julia had good taste. The plume of water drops some 80 feet/24 meters from the top of a granite cliff to a sandy cove below (not even footprints on the sand mar the perfection, as this beach is closed to the public)." Julia Pfeiffer Burns State Park is 21 miles south of California's famous Bixby Creek Bridge south of the Monterey peninsula. Click the map for directions and the Google map. "Letchworth State Park, renowned as the "Grand Canyon of the East," is one of the most scenically magnificent areas in the eastern U.S. The Genesee River roars through the gorge over three major waterfalls between cliffs--as high as 600 feet in some places--surrounded by lush forests. Hikers can choose among 66 miles of hiking trails. Trails are also available for horseback riding, biking, snowmobiling and cross-country skiing. Letchworth offers nature, history and performing arts programs, guided walks, tours, a summer lecture series, whitewater rafting, kayaking, a pool for swimming and hot air ballooning. Experiencing Letchworth by hot air balloon is unforgettable, as seen in this video clip." Virginia Hwy 311 runs through Paint Bank as it crosses the mountains north of Roanoke into West Virginia. The Paint Bank General Store, Swinging Bridge Restaurant, and Tingler's Mill are all at the one location. "The Paint Bank General Store has "a little bit of everything"... come see for yourself when you visit our authentic, small-town general store located in the heart of Paint Bank. 105 scenic miles on US 52 from Mt Airy, NC to Bramwell, WV. Click the map to see it in Google maps. I-77 runs through Virginia / West Virginia from Columbia, SC on it's way to Cleveland, OH. It crosses over and through the Appalachian Mountains (there's even a couple of tunnels). But there is another way - US Highway 52 meanders through the countryside. Catch US 52 north out of Mt. Airy, NC (Andy Griffith's hometown) for a ride you won't soon forget. The old Sheriff's car in Mt Airy, NC reminds us of the Andy Griffith Show. Mt Airy was Andy's real hometown. Approaching Fancy Gap, VA you climb over 1000 feet on this twisty stretch of road. In Fancy Gap, I've enjoyed both The Gap Deli and the Lakeview Restaurant (good catfish, but no lake view), and you can grab a drink or snacks at the gas station or the Dollar General. There's also an entrance for the Blue Ridge Parkway, where you can visit the Blue Ridge Music Center (south) or Mabry Mill and restaurant (north - just past Meadows of Dan), each within 20 miles. While you're in Meadows of Dan follow your sweet tooth to Nancy's Candy Company. The black licorice is wonderfully soft, unlike most hard licorice you find today. "The sounds of the fiddle, banjo, and guitar are likely to welcome you when you visit the Blue Ridge Music Center. Experience regional traditional music each day of the week with FREE local Mid-Day Mountain Musicians playing on the breezeway of the visitors center from Noon - 4 PM. The Music Center hosts a summer Roots of American Music Concert Series. Concerts take place in our beautiful outdoor amphitheater (capacity 2,500) at the base of Fisher Peak, feature local, regional, and national touring performers and bands, and are presented most Saturday evenings from late May through September." See the Mayberry Trading Post page on Facebook. Mabyerry Trading Post just off the Blue Ridge Parkway at MM180 between Fancy Gap and Meadows of Dan, VA has an interesting assortment of goodies for sale, but no gas here. Continuing north of Fancy Gap on US 52 there are nice views both north and south of the next town, Hillsville, where US 58 is turned into a huge flea market each Labor Day. North of Hillsville, US 52 quietly crosses the New River, far below the busy I-77 overpass before continuing north to Wytheville and on to Big Walker Lookout and the BW Country Store. "At an elevation of 3,405 feet, Big Walker Lookout affords one of the most spectacular views of the Appalachian Mountains to our visitors." "Located along Route 52, near historic Bramwell in Mercer County, Pinnacle Rock State Park is one of the more interesting day use parks operated by the West Virginia State Park system. The Corner Shop in Bramwell, WV has a soda fountain and candy counter. Burgers and other food is served. "ACF50 comes from the aerospace industry and the list of companies approving the product is rather serious. Firms such as Boeing Helicopter, Cessna, British Aerospace and Sikorsky all find the product acceptable, as does the FAA ... Application is easy on a bike and a tin lasts a long time. The best approach is to put a tiny blob on the surface to be treated and wait for it to disperse between any cracks. For example, the un-plated horn on our Suzuki V-Strom was an absolute certainty to corrode but it remains perfect after four years. Any surplus can be spread externally with a finger or brush. Surprisingly, because chemically things which work are normally dangerous, ACF 50 is completely non-toxic and your finger won’t drop off if you touch it. The 13 oz aerosol can is currently available for less than $13 plus shipping, which was $16 and $18 from Pilotshop.com and skygeek.com. Amazon's price + shipping was much lower. Click below to buy now. Latigo Canyon Rd near Malibu, CA - Google maps photo by teebone. California has some serious riding fun. The mountains north of Malibu north of LA have many twisty roads for your enjoyment, like the 10 miles on Latigo Canyon Road. Looks like a west coast version of Tennessee's "tail of the dragon". Anyone counted these curves? Mulholland Highway, north of Malibu, is a favorite among local California motorcyclists. Take a few hours and ride east from Portland, Oregon along the Historic Columbia River Highway. Stop at Vista House for the great views. You also pass Wahkeena Falls, and Horsetail Falls (aka Ponytail Falls). This old highway is a delight for motorcyclists and hikers. "The Vista House was built in 1916 at the same time as Highway 30 (what is now the Historic Columbia River Gorge Highway, and the only way to reach Crown Point). The building was designed to be a place of refreshment and enjoyment of the Columbia Gorge. The octagonal building with its green ceramic tile roof houses a museum, gift shop and interpretive display of historic and geologic points of interest in the Gorge." Historic Columbia River Highway runs east from Portland, Oregon. It's highly recommended for motorcycles. "Beautiful Bridal Veil Falls is an elegant and graceful lady that can be fully appreciated from the deck of a viewing platform rebuilt in 1996. The creek hustles down from the top of nearby Larch Mountain, tumbles over the cliff and eventually flows into the mighty Columbia River. No visit to the Columbia Gorge should be considered complete without a tour of the area of Bridal Veil and a visit to Bridal Veil Falls State Park." Bridal Veil Falls in spring, Oregon State Parks photo. Harrisonburg, VA is only 69 miles south of Winchester, VA on I-81, but 488 miles on our more scenic route. Ride for a couple of days, mostly in West Virginia on two US highways. US 50 is the northern leg from Winchester, VA to Parkersburg, WV and crosses the western tip of Maryland for about 10 miles. See the Google map. The southern leg is on US 33 from Ripley, WV to Harrisonburg, VA. There's more to ride just south on US 250, which travels northwest from Staunton, VA all the way to Sandusky, OH on Lake Erie. This ride is just south of Pittsburgh, near Front Royal, VA (the north end of the Blue Ridge Parkway and Skyline Drive) and is easily accessible from Ohio, Pennsylvania, and Maryland. It touches I-77, I-79, & I-81. Enjoy the ride. The Freedom Rock is about 50 miles west of Des Moines, Iowa. Deer poses for a photo. Palo Duro State Park, Texas. Google maps photo by Sergio Rebolledo. "As the second-largest canyon in the United States, it is roughly 70 mi long and has an average width of 6 mi, but reaches a width of 20 mi at places. Its depth is around 820 ft, but in some locations, it can increase up to 1,000 ft. Palo Duro Canyon has been named "The Grand Canyon of Texas" both for its size and for its dramatic geological features, including the multicolored layers of rock and steep mesa walls similar to those in the Grand Canyon." Looking to go camping? "Choose from campsites with water and electricity, primitive drive-up sites, equestrian sites, or backpack camping areas. Stay in one of three cabins on the canyon’s rim or four limited service cabins on the canyon floor. Rent our new pavilion for a wedding, reunion or meeting." Palo Duro Canyon State Park near Amarillo, TX. Google maps photo by Bobby McCracken. Caprock Canyon formation near Amarillo, TX. Google maps photo by Jeff Lynch. Bison herd at Caprock Canyons State Park near Amarillo, Texas. Caprock Canyons State Park has more formations, 2 hours southeast of Palo Duro. Plus you can check out their Bison herd. "History was made on Aug. 19, 2014 at Caprock Canyons State Park as cow #120 took the first steps to lead the Texas State Bison Herd into their new range within the park. The herd now has over 10,000 acres to roam. This legendary bison herd was started by famed cattleman Charles Goodnight and his wife Mary Ann in 1878. It is one of the five foundation herds credited with saving this magnificent animal from extinction." Warning! Highway 242 has steep drop-offs with no guard rails. It is not recommended for inexperienced riders. The 3 sisters peaks rise above the lava field. Google maps photo by Orbiker. "Dee Wright Observatory (Hwy 242 is closed Nov - June) is an observation structure at the summit of McKenzie Pass in the Cascade Mountains of Oregon. The structure is an open shelter constructed with lava stone. It is located in the midst of a large lava flow, and offers an exceptional view of numerous Cascade peaks." "The observatory is an open shelter built with lava stone found at the construction site. The viewing windows are cut to specifically highlight the neighboring mountains. These "lava tube" viewing holes allow visitors to easily identify the different Cascade peaks. There is also a 36 inch (90 cm) diameter, bronze azimuth-like "peak finder" on the observatory’s roof to help visitors locate nearby geologic features as well as the surrounding mountain peaks. From the top of the observatory, visitors have a panoramic view of the Cascade Mountain Range including Mount Hood in the far north." "The half-mile long Lava River Interpretive Trail begins at the observatory, and takes visitors on a 30-minute walk through lava beds. The trail is paved and easy to follow. Interpretive panels, located along the trail highlight the geology of the area. The trail also offers open vistas of the surrounding landscape." Oregon highway 242 to Dee Wright Observatory at McKenzie Pass is closed November thru June. "Kaaterskill Falls is a two-stage waterfall of Kaaterskill Creek, located in the eastern Catskill Mountains of New York, on the north side of Kaaterskill Clove, between the hamlets of Haines Falls and Palenville in Greene County's Town of Hunter. The two cascades total 260 feet (79 m) in height, making it one of the highest waterfalls in New York, and one of the Eastern United States' tallest waterfalls. The waterfalls are one of America's oldest tourist attractions, being depicted or described by many books, essays, poems and paintings of the early 19th century. Long before Alexis de Tocqueville's famous essay on America, Kaaterskill Falls was lauded as a place where a traveler could see a wilder image, a sort of primeval Eden. Beginning with Thomas Cole's first visit during 1825, they became a subject for painters of the Hudson River School, setting the wilderness ideal for American landscape painting. The Falls also inspired "Catterskill Falls", a poem by William Cullen Bryant." "This is one of the most popular hikes in the area, in part because everyone likes waterfalls, and in part because it’s a relatively short hike to a huge, 260-foot payoff, divided over two drops. Another highlight along the way is the smaller-but-still-awesome Bastion Falls, which flows past the trailhead and is easily visible from the road." Kaaterskill Falls is 50 miles south of Albany, New York. Mike Todd has posted some nice photos in a Picassa Web Album here. "Enjoy history, bluff-top views, outstanding trails and charming river towns along the Wisconsin Great River Road—Wisconsin’s only designated National Scenic Byway. The Wisconsin Great River Road parallels the Mississippi River for 250 miles ... Nearly two-thirds of the Wisconsin Great River Road passes along or through protected natural areas ... Scenic overlooks along the Wisconsin Great River Road are some of the best places in North America to see bald eagle ... The Wisconsin Great River Road passes through a region filled with farms, orchards and pastures ... For an unforgettable family road trip, a great getaway or a weeklong vacation, explore the Wisconsin Great River Road." Beartooth switchbacks have snow in June. Photo by Tony Taylor. Red Lodge, Montana is just 2 hours south of US 12. Idaho has beautiful scenery like this ride along the river. Photo by Tony Taylor. The Salmon River, Riggins Idaho, elevvation 1801. Photo by Tony Taylor. See Google map with directions. Over 1700 miles of US highway 12 begins at Wayzata, MN and ends in Washington state at the Pacific Ocean. A highlight of this ride is central Idaho, the Lewis and Clark Trail. Lewis and Clark were some of the first to travel this road. Photo by Tony Taylor. Highway 92 - the Colorado Dragon? "Big enough to be overwhelming, still intimate enough to feel the pulse of time, Black Canyon of the Gunnison exposes you to some of the steepest cliffs, oldest rock, and craggiest spires in North America." Painted Wall is one of the highlights of a visit to the Black Canyon of the Gunnison National Park, near Montrose, Colorado. This NPS photo by Lisa Lynch shows the Gunnison River flowing along the bottom of the shear canyon walls. See this and other photos at the link below. 60 mile round trip on Colorado 92 may just be Colorado's unknown "Dragon"
Is this 30 miles on Highway 92 (above) Colorado's version of the "dragon"? Combine these two maps for a half-day adventure from Montrose, Colorado featuring some nice curves, scenery, and the not well known Black Canyon of the Gunnison National Park. "However, my favourite feature is the “Plan winding route” function which suits my spur-of-the-moment sense of adventure and the need to try different roads. I reckon it’s brilliant and just what many bike riders have always wanted. We don’t always head out with a clear intention of where we are going, so this is very handy for those riders."